Sprayway Toba GTX Leg Gaiters are Waterproof with Gore-Tex super Breathable fabric & Hard Wearing with extra tough Cordura on the high wear points. An excellent gaiter made with Gore-Tex super breathable fabric. The elastication around the heel together with the single hand adjustable elasticated pull cord in the top hem will ensure the gaiters are held in place. Easy to put on with a front extra wide velcro fastened storm flap together with press studs top and bottom. A front hook enables the gaiters to be attached to boot laces and a tough, durable, fully adjustable strap fits under your boots. Available in three sizes: S/M; M/L or L/XL. 3-layer GORE-TEX® waterproof, windproof and super breathable fabric. Cordura Mini Rip-Stop cordura double weave, extra tough abrasion panels around base. Extra wide Velcro closure at front with metal press studs top and bottom. Single hand adjustable, elasticated drawcord in the top hem to hold the gaiters in place. Elasticated back heel for secure fit over boot. Front hook fits onto boot laces for a secure fit over your boots. 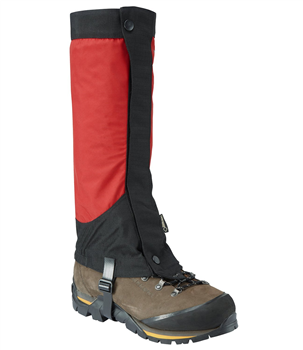 Tough bottom strap fits under boot holds the gaiter in position. Wash at 30 C; you can hand wash with soap such as or if machine washing please use either Grangers Wash. This protects the Durable Water Repellent (DWR) finish which will be damaged if detergent is used.